There are places that sit larger in the mind than they do in reality. For me, Boodjamulla (Lawn Hill) National Park is one such spot. When I cycled around Australia, seemingly several lifetimes ago, I always had the intention of detouring into this remote north Queensland national park – it was only 280 kilometres off the road, after all – but after the toughest stretch of the journey – 10 days and 1000 kilometres of gale-force headwinds across the Barkly Tableland – I could barely muster the energy to turn the corner. Instead, I holed up in a Mt Isa motel for three days, barely stepping out the door. 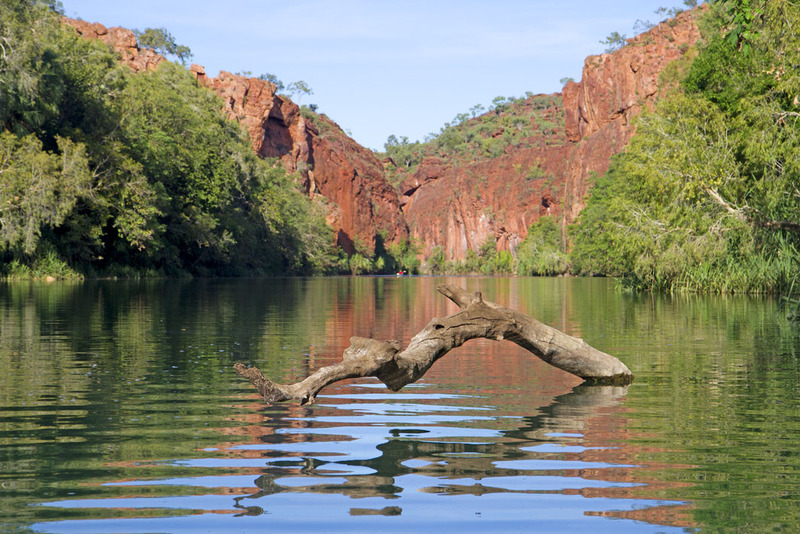 A few weeks ago, I finally made it to Boodjamulla and the gorge I’ve so long admired from afar. So much time had passed that, in my mind, it had come to be the size of the Grand Canyon. But it’s really quite a small gorge, its cliffs suddenly rising like an overbite above the river and then gone again a few kilometres later. And yet there’s great beauty in this compact, scale-model version of the place I imagined: calm mornings where you have to blow on the water to ruffle it, freshwater crocodiles sailing about, archerfish shooting down insects with gobs of water, and one of the outback’s best swimming holes at Indarri Falls. To kayak to Indarri, I imagined spending a day on the water. Instead I was at the base of the falls within about 40 minutes. Portage through and the navigable river pretty much peters out after another kilometre. So I kept portaging, towing the kayak through blockages, over pebble beds and through calf-high rapids, until finally I realised I could probably do with that swim at Indarri, after all. Turning back, I made the same portages until I spied a small run of rapids running off to one side. I climbed onto the kayak and bobbled through. What I hadn’t counted on was that nobody had been through here before me and an army of golden orb spiders had strung their webs low across the narrow channel. I popped out the other end covered in spiders. Perhaps I should have just contented myself with the swim. * Adventure before Avarice travelled courtesy of Tourism and Events Queensland.